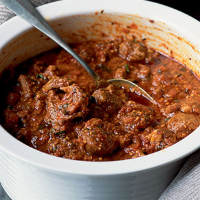 This is a typical Kashmiri dish of tender lamb in a thick, red-spiced sauce. If you like a fiery flavour, add a teaspoon of chilli powder or a chopped fresh red chilli. Preheat the oven to 180°C, gas mark 4. Cut 50g of the almonds in half lengthways and reserve. Put the remainder in a food processor and blend until ground. Heat the oil in a large frying pan. When hot, add the sliced almonds and fry them quickly until deep golden. Remove and drain with a slotted spoon. Add the fennel seeds to the pan and fry for 1 minute. Stir in the lamb and cook until sealed on all sides. Add the curry paste, paprika and ground almonds and fry gently, stirring frequently, for 5 minutes. Transfer to a casserole dish and tip in the tomatoes and seasoning. Swirl the pan residue with 4 tbsp water and add to the casserole. Cover and bake for 30 minutes. Reserve a third of the coriander for garnishing and chop the remainder. Stir into the lamb and bake for a further 15 minutes or until the lamb is very tender. Pile onto serving plates and scatter with the reserved coriander and the fried almonds. Serve with a bowl of plain yogurt or raita, shredded onion salad, steamed basmati or pilau rice.